Sustained and delicate liebacking. Well-protected at the cruxes.Mostly 5.8 to 5.9 fingers and hands with a few short 5.10 cruxes. 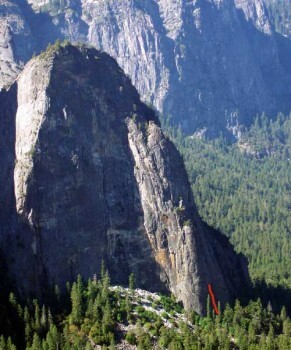 The climbing is varied, the rock is clean, and the rests are big. Requires every technique from fingers to a short offwidth, liebacks to underclings, often complemented with positive face holds. Well-protected with natural gear and one bolt. Bring extra cams if you want to sew it up. Rappel with two ropes. Which SuperTopo guidebooks include a topo for End of the Line?